I'm a bit lost completing projects before the end of the year, but today I wanted to take the opportunity to recommend this book thanks to PacktPub. 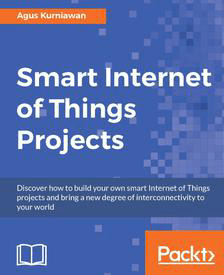 This book contains IoT projects such as building a smart temperature controller, creating your own vision machine project, building an autonomous mobile robot car, controlling IoT projects through voice commands, building IoT applications utilizing cloud technology and data science, and many more. Implement data science in your IoT projects and build a smart temperature controller. Create a simple machine learning application and implement decision system concepts. Develop a vision machine using OpenCV. Build a robot car with manual and automatic control. Implement speech modules with your own voice commands for IoT projects. Connect IoT to a cloud-based server. Remember that the book is available for a limited time and you must to sign up.